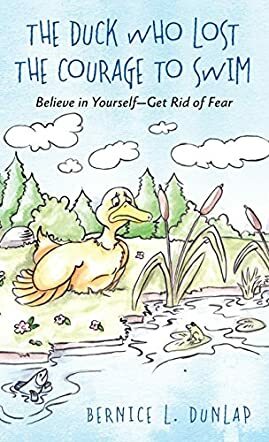 Meet Snowflake and Goldie Duck in The Duck Who Lost The Courage To Swim: Believe in Yourself - Get Rid of Fear by Bernice L. Dunlap. One Saturday, Snowflake went to meet Goldie Duck. She was sitting on the ground near the water and Snowflake wanted to go swimming. Goldie was not ready because she had a bad dream the previous night and had lost her courage to swim. Snowflake tried to comfort Goldie by telling her how these bad dreams were not real and she had to get on with her life. Would Goldie Duck be able to forget her bad dream and overcome her fear of swimming? It is a beautiful story about friendship, kindness, courage, and overcoming fears. The author conveys these concepts through the story of Goldie Duck and her lack of confidence when it came to swimming after having a bad dream. Apart from its wonderful messages, the book also introduces children to a lot of animals. The illustrations make the scenes vivid and give the animals their own personalities and individuality, revealing their characters and strengths. It is a good storybook for parents, tutors, and educators to help children and students to overcome their fears, believe in themselves, and become confident. This book is definitely a must-have and a must-read if there are children at home as these lessons are helpful through their growing up years and when they become adults. The topic has been handled well with many positive vibes, and the messages are good for adults as well.